At the end of each semester all students participating in the CSTEP Research Program must present an oral PowerPoint presentation. Each presenter will be given 10-15 minutes to present and discuss their research project to their fellow CSTEP Researchers. PowerPoint presentations should be prepared by the CSTEP Student Researcher under the guidance of their mentor. Workshops for preparing PowerPoint Presentation and Posters will be scheduled during the Fall semester. BARS is the highlight of the academic year for all BMCC research students. During this event all students who have performed research under a mentor are given the chance to showcase their hard work in front of a panel of judges as well as BMCC faculty and students. The winners of BARS will go on to participate in other competitions at other statewide or national institutions. 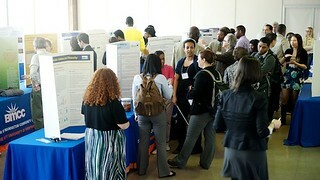 The Annual CSTEP Conference is the largest event of the academic year. Taking place at The Sagamore on Lake George, this event hosts 51 different CSTEP institutions. Ten students from each institution are allowed to participate in the competition portion of the event – eight in the poster board competition and two in the oral presentation. The Annual CSTEP Statewide Conference will be held April 13 – 15, 2018.